Toshiba Electronic Devices & Storage Corporation (“Toshiba”) today launches an integrated dual H-bridge DC brushed motor driver IC that includes an output current limiter function rated at 50V / 3.0A. The new TB67H401FTG device can handle applications where monitoring and feedback of the motor state is necessary, including office equipment, ATMs, home appliances, robotic cleaners and more—all devices that have grown in popularity in recent years and that often incorporate DC brushed motors. Until now, safe control of DC brushed motors has been accomplished by limiting the upper value of the motor current through a constant current limit. Over current is generated by the motor lock and is read from an external resistor through external circuitry, operational amplifiers and comparators, which increases the component count and circuit complexity. The highly integrated TB67H401FTG is fabricated with Toshiba’s BiCD process and has an inbuilt flag output circuit, which monitors the current state and indicates when it has reached the upper threshold. This ends the need for external circuitry and delivers smaller, more efficient motor solutions with reduced BOM costs. The TB67H401FTG supports a total of four drive modes; forward (CW), reverse (CCW), brake (short brake) and stop (off). It also includes a mode switching function that extends the application range. Single-bridge mode supports a single channel current of up to 6.0A, while dual-bridge mode allows use of two motors, with a single IC driving up to 3.0A per motor. The low on-resistance MOSFETs incorporated into the H-bridge (High side + Low side =0.49Ω typ.) ensure low losses and efficient operation. An internal regulator allows the device to be driven from a single 5V supply. 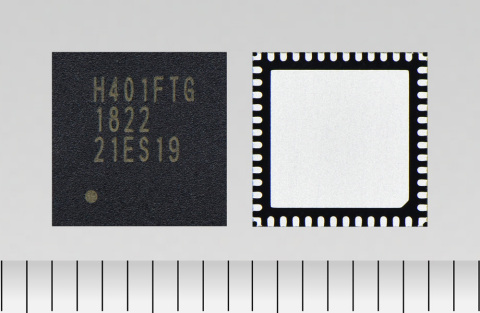 The tiny device is housed in a 7mm x 7mm x 0.9mm QFN48 package, which also includes thermal shutdown detection, over current protection and under voltage lockout. A general error detection signal enhances system safety by providing a warning to the main system controller. TB67H401FTG is now in mass production. Applications that need to monitor and feedback results on the motor drive state—industrial equipment, including office equipment and ATMs, home appliances, and robotic cleaners. A flag output function outputs results from the current limiter detection to an external device. It helps reduce the number of external amplifiers and comparators. Single-bridge mode supports high load drives (large current drive of 6.0 A). Dual-bridge mode supports driving of two motors with a single IC (3.0 A / 2 channels). It widens the range of applications. Thermal shutdown detection, over current protection, and under voltage lockout. The error detection signal can be output to the external device, helping to enhance safety. Other features Built-in flag output function that shows the result of the current limiter detection.